"There's a reason we love listening to classic rock," a friend of mine says to me from across the table at Starbucks. Same reason, I assume, as I stare down at my Chuck Taylors: we love classics and the history they bring with them. So maybe that's why it's best to use a classic image of a pirate and a ship from our history's past when looking forward to it's future. The story goes something like this: William Bass founds a brewery in 1777 in England. Known for its superior brewing methods and great taste, people can't get enough Bass Pale Ale, and as history schools us, the best thing to do when supply can't meet demand is to totally rip it off and attempt to profit from a watered-down version. So at the height of Bass's success, other breweries start claiming the recipe to pass off their ditchwater as Bass. But people, as smart beer-drinking people often do, notice and subsequently file appropriate complaints. Bass took its fair share of bruising, so to reclaim their greatness they came up with an idea: mark Bass barrels with a red triangle to indicate the authenticity of their brew. But as it turns out, red triangle stencils weren't in short supply in those times as other companies trying to profit from Bass's popularity began painting their barrels with red triangles too. Enough is enough, says Bass, which in 1875 decided they must place the mark they've been using in some sort of registry in an attempt to scrape the leeches off their product, recipe, and sign. Thus, the world sees the first trademarked symbol: a red triangle, signifying that only Bass Brewery could use it when marking their product. Lawsuits weren't far behind, I'm assuming. Nowadays we can't go more than five feet without seeing a trademark. Something distinctive signaling to us that someone identifies something with a distinguishing mark so that we know these products are different than similar commodities or services. As a writer, the impulse to test that previous sentence sweeps over me, so I look around at my desk. My printer has a distinct pairing of an "h" with a "p," and that's been registered. My computer has a funny looking piece of fruit with a bite out of it, and I'm willing to bet that that too has been registered. Even my coffee mug with the phrase "Life is Good" has that little "R" with a circle around it. I didn't have to even stand up. When it comes to products, we know the signs when we see them. And market studies show they work. There's a reason we immediately think of McDonald's when someone says golden arches—nothing else comes to mind. These symbols—along with taglines declaring that we're "loving it"—work when a company looks to brand itself. The American Marketing Association defines a brand as: "name, term, design, symbol, or any other feature that identifies one seller's good or service as distinct from those of other sellers… a brand may identify one item, a family of items, or all items of that seller." Simple enough, right? It keeps Pepsi from writing "Pepsi" like Coke. From this sign, an identity is born and branded. And this happens to cities too. But what happens when a city changes, shakes off some rust, and tries to take a look in the mirror with over 100,000 pairs of eyes in search of a collective image? A collective identity emerges. When we brand that image, that feeling, that identity, that way of life, we reinforce a message to ourselves while broadcasting to the nation and world in a resounding voice: here's what we are. So in other words, we make clear the difference between Erie, Colo. and Erie, Pa. is clear when people type "Erie" into a Google image search. hERItagE: What's in a name? Maybe you heard her referred to as the Gem City because of the sparkling waters lapping at her shoreline. But she's also been called the Flagship City, a reminder that history plays a large role in what she sees when she looks in the mirror. And perhaps you remember her listed as award-winning when in 1972 she was an All-America City. But perhaps one of the best descriptions of her came from Erie Reader's own Cory Vaillancourt, who likened her to a vixen dancing beautifully in the summer sun when he described her in last issue's cover story on the 19th Annual Blues and Jazz Festival—a description far better than I could ever provide. But it hasn't been all diamonds, ships, and awards basking in the summer sun. She's been called "turbulent Erie" and "the mistake on the lake." She's been described as the "shabbiest and most broken-down looking large town" when her courthouse wasn't looking so stately in 1855, which seems a bit harsher than the typical "Dreary Erie," as Urban Dictionary tries to tell me in between the onslaught of pop-ups. She's been the site of battles, the site of conflicts rendering bruises that fade but leave a pain that lingers. Erie, she's taken her many lumps as they've come. But those lumps build character, and suddenly we're left to decide whether we're staring at wrinkles formed from smiles or frowns. But what is in a name? And what is in the future of that name? After all, we don't stare into the mirror to look beside us, above us, below us, or behind us. No. We stare right into ourselves. But with the history told through the lines on our face, maybe the best way of getting to the future is to start with the past. Erie was nearly not Erie. When it first went on the books, many favored calling the settlement Presqu'Isle since most knew the area for the French Fort established on the strip of land just across the bay. But after a short-lived debate, residents agreed that "Erie" served as a better name. Maybe because it paid homage to our first settlers. Maybe because it wasn't so French. Regardless, Erie wasn't just Erie when things started. Folks involved in the building of Perry's fleet called the place Erietown but the "town" eventually fell off, as the place would continually struggle between the parameters of large town and small city. But whether we're calling it Presque Isle or Erietown, our first footprints walk from the path of manufacturing, and that sent a wave that still ripples through the city today. A tattoo, a marker, a brand declaring this is who and what we are. The French began by building their Fort out of bricks, but then Erie turns quiet for a few years and reserves her space while the country goes to war. Soon enough we're back to building, and now we're building ships, and we're building history and things aren't so peaceful in these parts anymore. Daniel Dobbins convinces authorities to have the fleet for the War of 1812 built here, and soon thereafter, Erie makes history as Commodore Oliver Hazard Perry declares from the Niagara, a ship constructed only a few miles from own house: "We have met the enemy and they are ours." So we celebrate. We record our history around Perry's success, and we hold the Niagara close to us. And since we were good at it, we keep building and become known as a shipbuilding region. So Erie, she gets stronger, but soon timberwork turns into ironwork. And soon her back is stronger, her hands more calloused, and we know who she is as she melds shipbuilding with manufacturing and births the Wolverine in 1833. Iron production solidifies manufacturing as our new identity while railway construction—although initially turbulent in Erie—increases, paving the way for future companies such as Griswold Manufacturing Company. 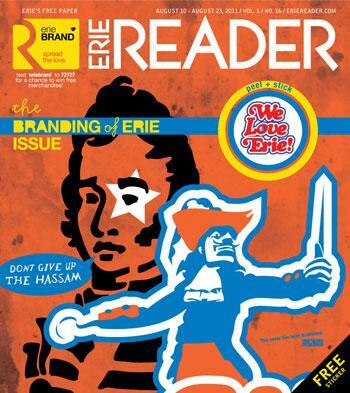 And with that, we see Erie branded through brands. If history speaks to us—and if we listen—we hear the tale of several companies synonymous with Erie: Koehler Beer, General Electric, Hammermill Paper, and Griswold. Before people found ways to market cities, the products we made locally spoke for us and in some ways still do. Take Koehler, for example. Heralded through advertising as "the Erieite's favorite," Koehler Beer, which came to the region in 1847, saw rich local and regional success. When someone "Collared a Koehler," they were thinking of Erie, whether they even realized it. And whether they realize it now, when patrons of the Brewerie at Union Station enjoy an Uncle Jackson's Blonde Ale, they're tipping their hat to the history of a company that closed its doors in 1978. But that brand is still out there, as posters, cans, bottles, and signs survive. For proof, check eBay. For further proof, turn on the History Channel. Right now, "Pawn Stars," a reality show centered around a family-operated pawn shop in Las Vegas, is one of the History Channel's most popular shows. Match that with another popular TV show "American Pickers," a show that chronicles two oddballs driving around in a van (who actually came to Erie) to buy and sell antiques, and suddenly you get the sense that Americans are rediscovering history and these pieces still have something to say. Couple this with the Griswold story. No, not the Matthew Griswold story, which is interesting enough given his marriage through companies and hand in bringing GE to Erie (he convinced a fellow Yales-man over a social engagement), but the Griswold and Cast Iron Cookware Association, a group founded in 1922 that boasts membership in 47 states. Consider that every time a piece of Griswold cast iron changes hands, people see the iconic symbol and read Erie, Pa. right below it. And so many of these companies, like GE, got their start here for one reason: location. Location, it's the one thing we can't change. And history shows us that our location has been an initial attraction in various times and ways. It's stated in "Facts About the Growth of the GE Plant, Erie, PA" brochure that GE selected Erie because of its "favorable geographical position, good transportation facilities, as well as the underlying layer of shale that is ideal for supporting equipment used in the manufacturing of heavy apparatus." As it turns out, some of those reasons—shale in particular—are still in discussion today. But GE wasn't the only company to come to Erie because of geographical position at the turn of the 20th century. Moritz Behrend and his two sons, Ernst and Otto, reportedly came to Erie in 1898 because of the 150-mile radius of hardwood forests. The Hammermill Paper Company called Erie home nearly a hundred years before merging with International Paper Company, which eventually left the region. And that stings. And somehow, that becomes our story: manufacturers come here, set up shop, thrive, employ locals, and then somehow before we know it, leave. Leaving us wondering what happened. But our location still holds value, especially in today's economy, so says Steven Pedigo. Pedigo, who works with the Creative Class Group and helps communities establish initiatives to attract and retain talent, paces back and forth in front of those attending the Economic Research Institute of Erie's ninth annual conference held a few weeks ago. The focus is on Brain Gain and Brain Drain, and Pedigo, who's charismatically stepped out from behind the podium to place himself closer to the crowd, tells us that Erie finds itself situated in the Chicago and Pittsburgh region. Most are likely thinking we didn't need a keynote speaker for that revelation. Then Pedigo tells us that his work with the Creative Class Group has found that the Chi-Pits region, as he calls it, is one of 40 mega-regions and these regions house 85 percent of worldwide innovation, two-thirds of the world's economic activity, and one-fifth of the world's population. Now he's got our attention. As it turns out, North America's megas account for 40 percent of the world's economic activity, and the Chi-Pits region ranks fourth in innovation. Turns out, we're in good company if we turn to our neighbors to the west. "If you don't consciously manage your image, it'll be managed for you, and we can't afford that to happen in a competitive market place," says Jacob Rouch, vice president of economic development of the Erie Regional Chamber and Growth Partnership. "You'd think there's a negative perspective," he suggests based on common observation. "The reality is they don't know we exist. We have no image." He speaks in bursts of words, working through a crescendo to some resolving chord. "That's both a challenge," wait for it, "and… an opportunity." There it is. What Rouch means is that the city can consciously go after shaping its image as opposed to trying to repair it. But before I know it, Rouch launches into a backstory, filling me in on the Chamber and its role in creating and maintaining an image for our city. Like the city, the Chamber's gone through some name changes. And like the city, the Chamber's had to evolve. For instance, the Chamber no longer deals in tourism but instead leaves that focus to Visit Erie. But before he gets into that, he's grabbing material from shelves, rifling through books, and finding pamphlets. He's excited to be talking about this stuff on a Wednesday morning at 9 a.m., and to be frank, now I am too. Amid the backstory, the pamphlets coupling the words Erie with Vacationland, Rouch sits back behind his desk. He adjusts the seat and settles in and begins talking about the Chamber's current business attraction campaign: "Tap into Erie." He flips me two brochures. One with a nearly full glass of beer, titled under the tap, ready to start frothing over. Now I'm thinking more about a pint of Uncle Jackson's than I am about some campaign. The other brochure is of tranquil water, with the words "Tap into Erie" deadcenter. A drop of water is coming out of the 'r'. Now I wouldn't mind a dip in the lake, maybe some paddleboarding. "It's all designed around tapping into our water resource," he snaps me back into his office and I sit the brochures down, realizing we're back at the start: location. "The idea is to look for a unique hook to attract businesses to come to Erie, and water is a unique aspect." Rouch talks at length about the lake as well as the investments the city's made to its water and sewage treatment. Based in part on our history (International Paper for example required the extensive use of water), we're equipped to, as Rouch puts it, "build off a legacy that gives us a leg up on that asset." But it's not all diamonds, ships, and awards basking in the summer sun. Rouch's voice drops a bit and he leans in closer. I lean in too—I want to hear this. "We need to address self-worth, our self-image," he says. "That's easily our biggest weakness as far as being successful on our tourism front and our business attraction front." Then Rouch tells me he'd pack his bags and move to Portland, Ore. in a heartbeat. Not that he wants to, but the people there did a damn fine job of nearly convincing him. The people, he tells me, go out of their way to talk about the greatness of their city, a place somewhat similar to Erie or Pittsburgh. Erieites, he inhales, have a tendency to do the opposite. "Positive energy attracts opportunities and it gets people changing their minds of how we can do something or can afford to do it," and he's right since I'm wondering what Portland's like and I've only heard another guy's 10 second experience. "You've got to love yourself before other people can love you." So we're talking about campaigns and brands and taglines and slogans and all the terminology starts running together, mixing around in the lake water Rouch and I are sitting about a hundred yards from. Erie, her heritage runs strong through manufacturing and for a long time, we've dentified her with literal brands connected to the city. But different brands—marketing campaigns—have emerged in more recent years. There was "We Love Erie," which was because of Mayor Tullio and was directly tied to a festival celebrating the city: We Love Erie Days, which is now Celebrate Erie. There was also Eriesistable, which still leaves evidence around the city (it's still visible on some landmarks and now the Bayhawk's cheerleading squad dons the name). Maybe it's no coincidence that these marketing campaigns and brands emerge at the onset of the decline of manufacturing. As we fret at the thought of losing our image, we strive to create one to attach ourselves to. Recently, there was, "PS: It's OK to Love Erie" and "Heart Erie," an initiative started by businessman Rob Schultz. These campaigns, and similar ones, emerge and thrive at the will of the private sector, which means these brands, taglines, mottos, and so on come at the expense of private money and interest. Take for instance, Matt Texter's work with Lamar. Texter, a designer for Lamar and a local musician, played a role in the "PS…" and hearts that are now sprouting up on billboards declaring things such as: Heart Erie, Heart PI, and so forth. "PS" came about at a time "Napoleon Dynamite" was popular, Texter tells me during a phone conversation. So he played up that style. Lamar, a billboard company, fills vacant slots here with local ads, such as that. And "PS" came about, Texter explains, because people tend to say "off the cuff" they don't like Erie. Texter's working on something new. "We want to start community interaction," he tells me, as he starts explaining how Lamar's digital billboards can assist in promoting Erie. These new ads pair a thumb and the words "Like Erie." If it sounds all too much like Facebook, you're right: that's Texter's point. People will visit the Facebook page, like Erie, and then, they can upload images as well text explaining why they like Erie. These posts, Texter says, will then feed to the electronic billboards that can be updated in real time. It's a grass-roots effort, he explains. And he hopes it will work, after all, Lamar's doing this because space is available. "I'll bore you with this story, OK?" Rouch says, which immediately makes me believe this story will be anything but boring. "If I went back to 1970—1975. If I walk down the street in Erie and said, 'let me paint you a picture and you tell me what Erie looks like: GE will be a third of the size it is today, Hammermill will be gone, Amsco will be gone, Zurn will be half, maybe a third of the size, and Lord Corporation will no longer be headquartered here.'" He pauses to let the image set in. "And there's not going to be any locally owned banks. I give you that scenario, tell me what Erie looks like in 2010. Boarded up buildings? Twenty-five percent unemployment?" He pauses to let the entirety of the scenario sink in. "No. And every one of those things happened." Rouch mentions the unemployment rate, which stands under 10 percent after a bank-rattling recession. While he concedes that we're technically less wealthy, he credits smaller manufacturers starting new businesses as well as the growth of healthcare and education in our area. Then he sums it all up: "the optimists have to win." Sure, some people badmouth the city. Others just shrug their shoulders. But those folks back in Portland are up to something, and it's all based on attitude. To paraphrase one of Texter's billboards: It's cold in the winter in other places too. The small stuff we're not supposed to sweat can add up if we let it: the weather, the economy, jobs, and so on. But the other small stuff can add up to: growth in new sectors, new companies sprouting in the city, one banner we can all unite under to declare the goodness of our city. So maybe we have to reluctantly say, It's OK to Love Erie before we can just say we love her—this way we win over the naysayers, the locals who don't believe in their own backyard. But now, as the next Perry Commemoration—the festivals we center our history around—draws near, we must be bold in our declaration and sound in our proclamation: We Love Erie. Because if the optimists don't win and we don't take pride in our city and tell her we love her, what will be the tone for the next 50 years when some writer sits down to try to tell this story again?